New Baby and Family Pet? How to Transition Easier. A beloved family pet waiting at home or brought into the home during your baby’s newborn period can lead to an exciting adventure for the new baby and the pet. 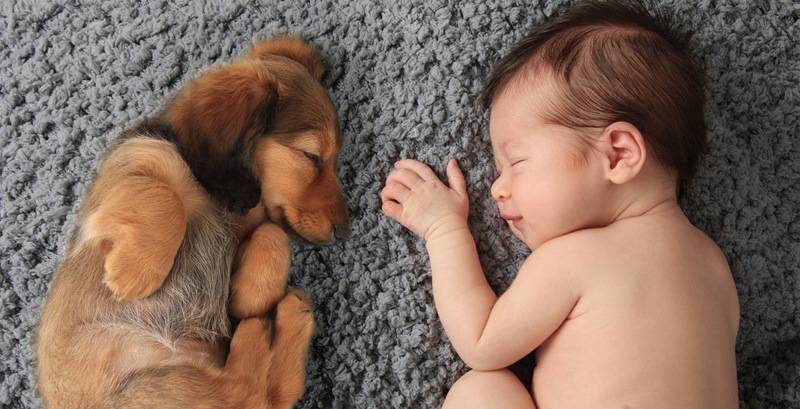 If you already have a family pet, you can incorporate the pet into your baby’s life. 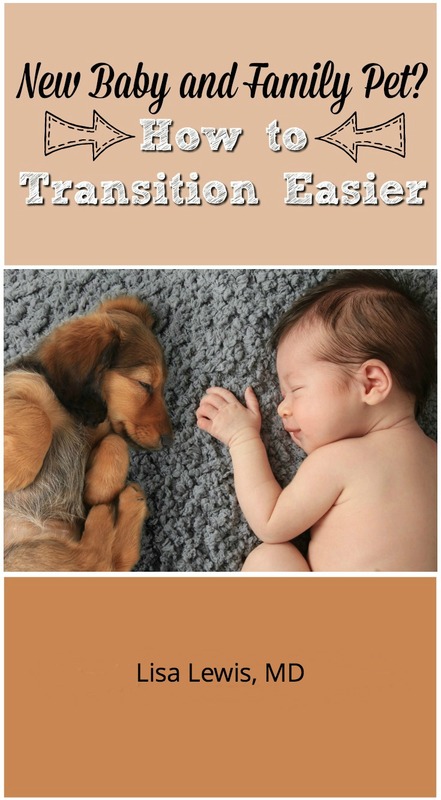 Here are some tips to help your family pet and new baby transition more easily into their shared lives. Before you introduce your baby to your pet, ensure that you have the pet seen by a veterinary doctor and that it receives an A+ on its health exam. Your animal should be clean and free of fleas. Pet shampoos may cause rashes on babies, so be aware of this when your infant interacts with the animal. Ideally, your pet should be spayed or neutered. This procedure will ensure that your pet is calmer in general. When animals are in a breeding phase, they are more likely to be agitated or moody. Animals that have recently had babies are more likely to attack a child or adult who is near their offspring. Play recordings of a baby crying so the animal can get used to the noise. Before your baby comes home, use the baby’s name in conversation with the pet. The Humane Society recommends that before you take the baby home, let the animal sniff a blanket or something with the baby’s scent. Gradually decrease the amount of time you spend with your animal. Don’t do it to the point of the animal feeling neglected; but your pet must realize that it can’t be the center of attention. Consider asking another person who visits frequently or lives with the animal to act as a “surrogate” and give extra attention to the pet while a parent is busy with the baby. It’s normal for a pet to feel jealous of the new baby. After all, Rover was the center of attention before “she” came along. If your dog is jealous of the baby, you absolutely cannot leave your baby alone with the animal. A jealous cat is likely to appear nonchalant. A jealous dog may become aggressive toward the baby for no reason. Never leave your baby alone in the room with your pet. Even if your dog or cat appears loving toward your new baby, remain firm and don’t leave your new baby alone with it. If the baby inadvertently startles or frightens your family pet, the animal could very quickly scratch or bite. The nicest dog or cat may still become afraid or jealous and suddenly lash out. Dog owners should work on negative behaviors that may affect the baby. Address any behavior problems well before the baby arrives. If your dog has unruly behavior that may be bothersome or dangerous for the baby, consider a training course. Have visitors in the house frequently before the baby is born so the animal can get used to other people. A friend with an infant is ideal! When you set up your baby’s room, discourage your animal from jumping on the crib. Jumping is a behavior problem that you should deal with before the baby comes home. Give a lot of positive reinforcement for good behavior. If you continually reprimand your pet after you get home, it may become anxious or stressed. Don’t forget to make some time for your pet every day. Babies and Pregnant Women Should not be in contact with a litter box. Cat feces can carry Toxoplasma gondii, which can make a baby sick, cause problems with brain development, and even cause hearing loss and blindness. A pregnant woman should not change a cat’s litter box, and others should use a gloved hand to change the litter box and wash their hands after. Litter boxes should not be in a room where the baby is present. Birds, even family-friendly birds, should be kept in the cage while the baby is in the room. A good time to take your bird out of the cage is after your baby goes to sleep at night or while someone else is tending to your baby. Birds can be amazing pets and quite entertaining for babies. Birds can be animated, and make noises that are delightful for a baby to hear. They love their families and, when well trained, can be very affectionate. Some birds may like to cuddle with their owners. However, birds don’t want to please you or your baby. It’s unlikely that your bird will have nurturing instincts toward the new baby, so the baby’s impulsive movements very well may intimidate your bird. If a bird is afraid, it will bite very quickly and can cause serious injury. Keep the bird on display for your baby, but take it out when the baby is not in the room. Always wash your hands with warm soapy water after handling your bird or cleaning its cage. Reptiles should be kept in their cages while the baby is in the home. Reptiles don’t instinctively enjoy babies, and may decide to bite or harm a baby. A snake can squeeze a baby and cause injury. Reptiles may carry Salmonella which can be toxic to a baby. Owners of lizards, turtles, and other reptiles should wash their hands with warm soapy water after handling their pet. Reptiles often carry organisms that infect the baby, such as Salmonella, which may cause life-threatening diarrhea. Talk to your veterinarian about checking for Salmonella, and have a full exam of the reptile before your baby comes home. If you have a baby and are thinking of getting an animal, wait until your child is older to get a higher-maintenance animal like a cat or dog. Babies and toddlers will never understand proper animal etiquette (don’t pull the dog’s hair! ), and have to be watched closely. Children are at risk of being scratched or bitten. If you feel a need to get a new pet, consider a fish or a small reptile that the baby may view but not touch. Talk to your pediatrician. Make sure you feel comfortable about the new interaction and relationship with the pet and new baby. Check to see if your Humane Society or ASPCA has any training workshops for parents-to-be at www.humanesociety.org or www.aspca.org. If you live in Europe, reference Humane Society International at www.hsi.org/world/europe.